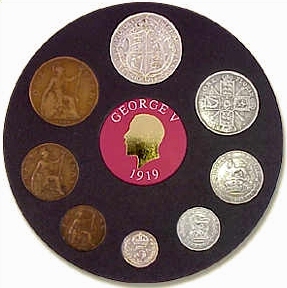 1919 British Coin Set - ideal commemorative gift! This distinctive gift compliments the recipient with an attractive set of orginal 1919 British coins minted in his or her birth year or other significant anniversary date. The fascinating and informative illustrated history, with accompanying Collectors Notes, provides both a pleasurable and educational way to revisit the past. If you are interested in buying a commemorative, birthday, or anniversary gift, you may also be interested in our range of newspaper albums from a SPECIFIC DAY in 1919.